Why are there so many flavours of potato chips these days? The great potato chip debate: What's your flavour? I AM really starting to feel my age. I've heard it said that you are getting old if police officers look young; our local coppers, well, the male ones anyway, aren't old enough to shave yet. The other sure sign is that I am getting cross about potato chips. Every time I go to the supermarket down the road, they seem to have taken over another aisle. Now look. I know it's taking a dangerous road by starting off a statement with "When I was young", but, well, when I was young potato chips came in two flavours. Plain salted and chicken. While back then I don't think it was a requirement to list ingredients on food packaging, if it had been then I doubt "chicken" would have made said list. It may have, but I am going on the record as never having tasted a chicken-flavoured product that tasted like chicken ... other than chicken. Fast forward a year or two and salt and vinegar had been added to the list, a nod to the somewhat quaint British habit of sprinkling their Saturday night takeaway cod and chips with a bit of Cornwell's finest malt. About that same time, I think, "thin" chips were introduced, giving the crinkle-cuts a run for their money. See the dilemma? One minute we had two choices. The next, there are eleventy million, including Wagyu beef, fresh lime (really - in a chip packet there's fresh lime!) and Champagne vinaigrette. And don't get me started on the sweet potato lot. We mustn't forget the chippies that come in a tube. Pringles were invented (yes, invented) back in the 1960s by a company more famous for making soap. The bloke who designed the distinctive tube liked it so much he had his ashes buried in one when he died. History doesn't record what he died from, but I have my suspicions. 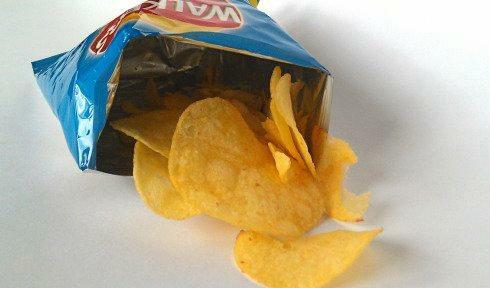 Pringles contain around 42 per cent of actual potato. Yikes. At one point in Britain they were considered to be more like a cake or biscuit, and therefore didn't attract the VAT (similar to our GST) charged on potato chips. And so we come to snack foods in general. The cheesy/barbecue-y snacks - often no more than deep-fried salty air. A friend of mine confessed to me two weeks ago that she had eaten a bag of Twisties for lunch. Not so remarkable, you might think, except of all my friends she has by far the healthiest diet; she has never been inside a McDonald's and no red meat ever passes her lips. But once a year she indulges in this bright yellow bag of crunch. Interesting aside - in Thailand they sell Choco Banana Twisties, while Malaysia features an effervescent variety that stains your tongue blue.